With the development of new quantitative strategies and powerful bioinformatics tools to cope with the analysis of the large amounts of data generated in proteomics experiments, liquid chromatography with tandem mass spectrometry (LC-MS/MS) is making possible the analysis of proteins on a global scale, meaning that proteomics can now start competing with cDNA microarrays for the analysis of whole genomes. 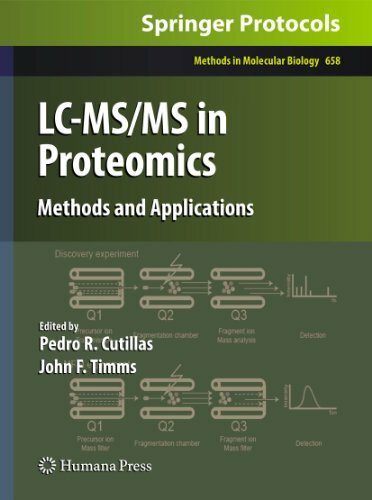 In LC-MS/MS in Proteomics: Methods and Applications, experts in the field provide protocols and up-to-date reviews of the applications of LC-MS/MS, with a particular focus on MS-based methods of protein and peptide quantification and the analysis of post-translational modifications. Beginning with overviews of the use of LC-M/MS in protein analysis, the book continues with topics such as protocols for the analysis of post-translational modifications, with particular focus on phosphorylation and glycosylation, popular techniques for quantitative proteomics, such as multiple reaction monitoring, metabolic labelling, and chemical tagging, biomarker discovery in biological fluids, as well as novel applications of LC-MS/MS. Written in the highly successful Methods in Molecular Biology&#x2122; series format, chapters include introductions to their respective subjects, lists of necessary materials and reagents, step-by-step, readily reproducible laboratory protocols, and notes on troubleshooting and avoiding known pitfalls. Comprehensive and cutting-edge, LC-MS/MS in Proteomics: Methods and Applications presents the techniques and concepts necessary in order to aid proteomic practitioners in the application of LC-MS/MS to essentially any biological problem.